Secondary school Students, visit of 27.12.2017 - givekidsadreams Webseite! Setting out their day on Wednesday, December 27, 2017, Mrs Ngọc Anh and Mrs Ninh Hong arranged to meet the Vice-Principal of Vo Thanh Trang High School Tan Phu, and students who had applied for their scholarships; then later in the afternoon, both ladies arranged to meet the family of each student, getting to know more about their difficulties as well as to comprehend their poor situations. A foremost example of a student’s emotional story is that, Nguyen Ngoc Anh Thao whose parents Ngoc-Anh and Ninh Hong had met at the school campus this morning, whose situation has touched the two ladies the most; Anh-Thao’s father, a porter in a steel factory, also a main financial support of the entire family, whose wife (Anh Thao’s mother), became disable after an accident, and his daughter, (Anh Thao’s sister), a disability at young age; yet Anh-Thao’s other two brothers died by major strokes. Noticeably, Tran Hoang Huy, a 7th grader, living in a rented room, whose parents struggling for daily meals by peddling cakes from street to street, also selling sticky-rice in the afternoon. Pham Minh Phuong, an 8th grader, whose father is unable to work as a main source of family support, due to palate cancer. 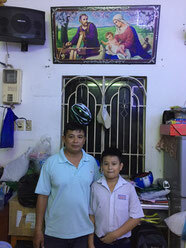 Nguyen Thanh Hieu, a 7th grader, lives at his grandmother's house with a divorced father who rides motorbike as Uber to get by for living to support his two sons in school. Vu Hong Tra My, a paternal orphan, is at 7th grade. Her mother sells sticky-rice rolls in the morning, and works as a maid in the evening for a living. Back to the road on January 6, 2018, Ngoc Anh and Ninh Hong arranged their time to visit the families of Pham Van Chieu primary school students, located in the 12th district, and families of the Nguyen Viet Xuan primary school and Le Hoan primary school, located in Go Vap district as well. The two ladies brought cakes and a “Lì-xì envelope“, contains some cash inside as donation, offered by Ngoc Anh’s mother to the children with financial difficulties. The two ladies would have not made their way to the house of this family without the help of Bui Quoc Huy’s father, since the address shows 501/9/12/17, a tripple-alley sign, meaning an alley, normally derived from a main street, connecting to another and on. 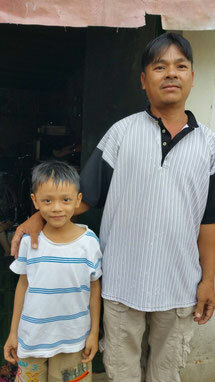 Bui Quoc Huy, an eight-year old 1st grader, lost mother at his age of 4, currently lives with his father at the grandfather’s house. Quoc Huy’s father works as transporting construction materials, by riding his motorcycle trailer. The two ladies visited them at this house, where they found a group of people, sharing a limited space, and insufficient source of lights for reading. 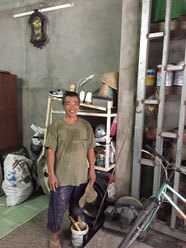 Huy’s 19-year old brother lives at the house of the owner of whom he has learned car mechanician as apprentice. Since the address of a student, Pham Thanh Tam, 2nd grader, is marked “unknown”, therefore Ninh Hong and Ngoc Anh had to wait in front at the school gate until his grandmother showed up in bicycles to lead the two ladies to the student’s place. Thanh Tam’s parents are divorced and each person re-married to a new spouse. Unfortunately, his parents give him to their parents for raising their kid without giving child support. Thanh Tam currently lives with his grand-parents in a rented place. 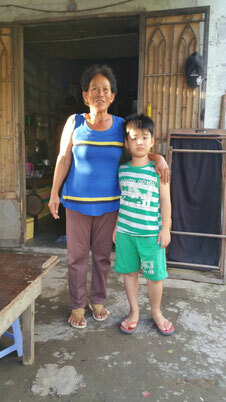 His grandfather found a part-time job as a helper at the construction site in town, while his grandmother collects recycled objects to sell for living. The rent usually costs 600.000 VND/ month and now is getting higher beyond their afford; the family might end up being kicked out of the house. Although he lives in such a condition, Thanh Tam appeared to be a smart, and intelligent kid. Having a conversation with Thanh Tam’s grandmother, Ninh Hong noticed that the student was holding the paper while reading within a pretty close distance from his bare eyes; which is a sign of near-sighted vision. His grandmother stated that Thanh Tam has had bone inflamatory issue which has bothered him quite often. His grandmother added that he was advised to take inflamatory drugs to relieve the pain, which is not recommended for a persistent case. Gratefully, Thanh Tam’s sponsor offerred the expense of vision care and the adequate lighting set up, and a set of table and chair for this student. 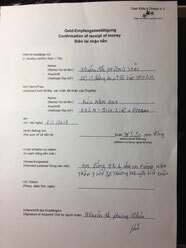 As for Ninh Hong, she would arrange her own time to take Thanh Tam for a check-up at the doctor of her acquaintance. Truong Thanh Tam, 3rd grader, living with her mother in a small rented place, in Go Vap district. Her father left their house after their divorce 2 years ago without any child support responsibility. Her mother is original from Hue, who has a severe facial-burnt mark toward her left eye as a consequence of tripping into a fire at her young age. Due to financial difficulties, the mother failed to continue her education after her 10th grade; she then moved to Saigon for living. The mother and her daughter currently live in a tiny room, approximately measured 12 square meters, and the rent and electricity bills cost 1.500.000 VND per month. Tam’s mother can only earn average about 150.000 - 200.000 VND per day, by selling lottery tickets on the street; notifying that it is not a stable income a day for family. The monthly fees of which the mom relatively spends for her daughter as half-day studying at school is about 1.2 million VND per month. Thanh Tam apparently got thyroid goiter disease, still she has had to wait for an approval of health insurance at school for a check-up, per the mother’s statement. Fortunately, Mrs Ninh Hong has gained the agreement of pediatricians at the oncology hospital to treat the two students, Pham Than Tam and Truong Thanh Tam, without fees charge. Huynh Ngoc Tram and her other 2 siblings live with their mother in her maternal grandparents' home. The grandparents finally paid off the purchase of their house of which they loaned from 2009 to early of the year 2017. The house is large enough that her grandparents have 3 rooms for rent. They also gained a bit more income by doing laundry services. Ngoc Tram’ mother has contributed 1.500.000 VND per month to help grandparents from a huge burden, although she earns not much income by selling sticky-rice rolls in the morning, and doing chores service in the evening. Ngoc Tram’s father left home to look after her grandfather, who is so ill at the old age, living in the countryside. Although Ngoc Tram’s family lives in the city, but her case is also qualified to receive a scholarship, comparing those of the other students, on the account of low income family. Ngoc Anh and Ninh Hong stated: “Although the district 12th and district An Phu Dong have been divided by a dark, poluted river. It takes only 5 minutes to across the river using the An Phu Dong’s ferry. One can easily notice that the difference in urbanized features between the two districts, district An-Phu-Dong and district 12th. It is apparently viewed that some buildings have been recently built in district 12th, yet there is not sight of a vehicle is spotted on the streets, but motorcycles and bicycles. Per Ninh Hong’s note: “Having known that a field trip to visit each student’s family, in one hand is weary, on the other hand, the great experience and knowledge through contacting and witnessing each student’s daily activities, and the hardship that his/her family has been through, brought me happiness to fulfill my task. I also find behind each of these dark clouded faces, simple demeanors, and genuine souls. Noticeably, Tam, a cute young boy, with a bright and delightful look; as well as the charming, gentle demeanor of Chau Thi Yen Qui, a young girl at Can Gio district, who is claimed as patient relating to HIV positive, rendered from her father’s AIDS illness. Having education, starting from kindergarten to academic studying, is quite a long learning path; it is considered these “education seed“ is expected to be properly cultivated in a proper habitat, until it gains a full blossom or harvest; Greenleaves implemented education Program is designed to help students with hardship to have a chance to keep up with their dreams within their talents, and move forward to become better persons in a society. Your great contributions to this program, in a sense of cultivate motivation of our young students toward their future over the coming decade, are tremendously appreciated by us, particularly the students and their families.